The WISE is excited to continue showcasing the work of local visual artists from East Vancouver and beyond. The project aims to increase exposure for participating artists, reinforce positive associations with the local arts community, and increase lounge ambience. 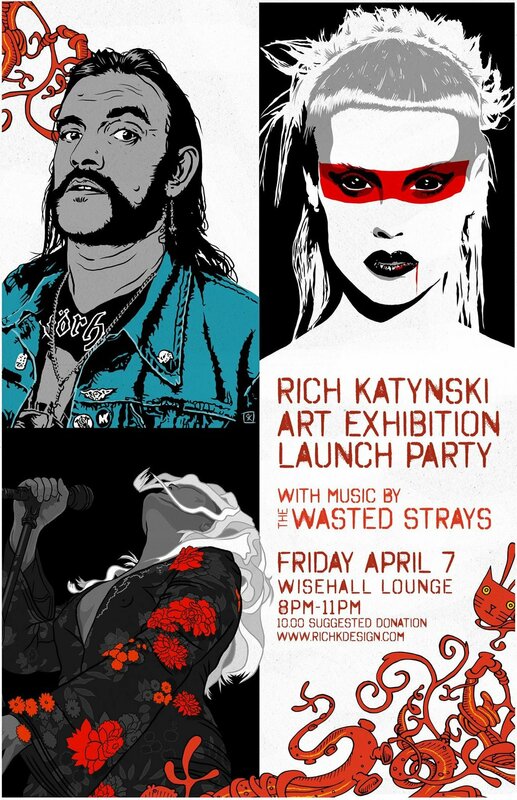 We are thrilled to showcase Rich Katynski April in the WISE Lounge. An official launch will take place Friday, April 7th 2017 featuring a night of music from one of Rich's bands: Wasted Strays. Show starts at 8pm. 10.00 suggested donation at the door. The dudes in Wasted Strays are all long-time punk rock veterans, having played in or currently playing in such bands as Scum Element, DOA, Death Sentence, Legion of Goons, Excessives, Real McKenzies, Rampage, Gold Stars are for Succkers and the greatest Iron Maiden tribute band in the world, Powerclown. Whilst all of Wasted Strays members are accomplished musicians in their respective musical endeavours, when they are Wasted Strays they combine to form a street-country Voltron. LiveVan.com is a Community Driven Music Calendar & Industry Directory for Vancouver. All content is entered, shared and maintained by our users. Log in to see what others have already given you access to.